As innkeepers who have been around quite a while (over 40 years now), we congratulate BedandBreakfast.com on their 20th year as leaders in our industry. To commemorate this occasion, B&B.com provided USAToday.com with a private tour of 20 Inns and B&Bs across the country, which in turn inspired a feature photo article: 20 great B&B’s for a holiday — or any — weekend. Old Rittenhouse Inn is pleased to be included among our peers in the article, which features a lovely shot of the Le Chateau property at dusk taken by photographer Christian Giannelli. The accompanying text makes note of the Phillips family’s 40 years in the inn keeping business. A second photo, also by Giannelli, depicts Room IV, one of the Old Rittenhouse Inn’s original bedrooms, and shows off the room’s antique furniture, stained glass, and period wall coverings. In fact, that’s frequently how it goes at the Inn according to Phillips, who says that often the talent and creativity it takes to run the Inn come from within. And then there’s Julie! ‘We are so fortunate to have had my Aunt, Julie Phillips, with us all these years. She can cover just about any job at the Inn. Julie is knowledgeable and personable, and guests just love her. She really is an extension of ourselves as innkeepers. We trust her with our lives,” says Mark. The Phillips family kept their hospitality business going for over 40 years by assembling a recipe for success that includes five ingredients: unique historic properties, a destination location, a hard working staff, dedicated owner/innkeepers, and the best, most loyal customers in the world. The owners and innkeepers, Jerry, Mary, Mark, Wendy, and Julie, thank everyone who had a hand in making Old Rittenhouse Inn one of USA Today’s Top 20 B&Bs. We will work hard to continue to be worthy of such an honor. Get ready for our Red Wine Weekend taking place Feb 6-7, 2015. Enjoy fine wines, delicious food, and exceptional lodging in Bayfield, WI. Events are held at Le Chateau, a sister property of Old Rittenhouse Inn, and the historic Landmark Restaurant at Old Rittenhouse Inn. The highlight of the weekend events is a 6-course dinner with wines specially selected by the weekend’s guest host, Dennis Kohl, to match each dish. Chateau Greysac Medoc-France – 2009 made with Merlot, Cabernet Sauvignon, Cabernet Franc, Petite Verdot. Helena Road Vineyard, Maier Family Cenote , Sonoma County -2007 made with Cabernet Sauvignon, Merlot, Cabernet Franc. Castelmaure Col Des Vents Corbieres -2013 made from Carignane, Grenache and syrah. the Big Easy from Fess Parker, Santa Barbara- 2010 made from Syrah, Petit Syrah and Grenache. For discount weekend lodging packages, Call 715-779-5111 or Book Online to reserve your place at the table. Get ready for our Red Wine Weekend taking place Jan. 31 – Feb 1, 2014. Enjoy fine wines, delicious food, and exceptional lodging in Bayfield WI. Events are held at Le Chateau, a sister property of Old Rittenhouse Inn, and the historic Landmark Restaurant at Old Rittenhouse Inn. The highlight of the weekend is a 6-course Italian dinner with Italian wines specially selected by the weekend’s guest host, Dennis Kohl, to match each dish. Join Dennis Kohl and Julie Phillips for a festive and fun weekend! Discount weekend lodging packages include the Friday California Pinot Noir tasting and appetizer reception, a hearty 2-course breakfast each morning, a Saturday tasting of French Reds and “Ringers” (a white wine, a Spanish wine, and an American Syrah) and the highlight of the weekend: Saturday evening’s 6-course Italian-themed Red Wine Dinner (see menu below). Call 715-779-5111 or Book Online to Reserve Your Spot! This casual event is your chance to enjoy 6 different California Pinot Noirs and a buffet of gourmet appetizers and desserts prepared by Old Rittenhouse Inn’s Landmark Restaurant. This tasting is held at our Le Chateau property, located at 7 Rice Avenue in Bayfield. The event is included in the Red Wine Weekend Lodging Package, or available a’ la carte for $45/person plus tax and gratuity. Advance Reservations Required for this event. Call 715-779-5111 to Reserve Your Spot! -Marinated flank steak with bleu cheese sauce. Sample some tasty wines with us! On Saturday afternoon, host Dennis Kohl takes guests on a tour of delicious French Reds. The journey includes stops in several of France’s famed growing regions, as well as a few “Ringers:” a white wine, a Spanish red, and an American Syrah. This event is included in the Red Wine Weekend Lodging Package, or available a’ la carte for $45/person plus tax and gratuity.Call 715-779-5111 to Reserve Your Spot! From the vine to the glass, we love wine weekend! Without a doubt, the highlight of the weekend is the Italian Red Wine Dinner served at Old Rittenhouse Inn’s Landmark Restaurant on Saturday evening. Each of the 6 courses is accompanied by an Italian wine selected by host, Dennis Kohl, to compliment the amazing Italian menu created by chef Matt Chingo. The meal includes an appetizer, soup, salad, sorbet, a choice of entree, and dessert, plus all the wines. This event is included in the Red Wine Weekend Lodging Package, or available a’ la carte for $75/person plus tax and gratuity.Call 715-779-5111 to Reserve Your Spot! Enjoy our tasty menu paired with great wines. $75 + tax and gratuity. Call 715-779-5111 to Reserve Your Spot! This is surely one of our most favorite times of year… Wedding Season in Bayfield, Wisconsin! Bayfield is fast becoming known as a Wisconsin Wedding Destination, and for good reason: the beauty of Bayfield and Lake Superior offer numerous locations for your ceremony and reception. The Rittenhouse inn and our historic properties are ideal Bayfield wedding venues offering both indoor and outdoor options. Our on-site Wedding Planner and Events Director, Wendy Phillips, works closely with couples to help bring their dream wedding to life. Wendy can arrange for a wide array of wedding services including Officiants, Menu Planning, Wine and Bar Service, Professional Event Staffing, Florists, Musicians, Wedding Cakes and Tortes, Hairdressers and Make-Up Artists, Massage and Spa Treatments, Tent Canopy Rental, Banquet Rental Items, Limosine Services or Horse-drawn Carriage, and even Babysitting! Bayfield wedding receptions at the Rittenhouse Inn or Chateau Boutin are as unique as the couples who are married here. Our on-site wedding planner and helpful staff guide you thorough the planning process to create an event that reflects your individual taste and style. If you can dream it, we’ll do our best to make it a reality. And when it comes to fine dining and catering, no-one in the area can top Rittenhouse Inn’s Landmark Restaurant. A Bayfield wedding reception at Le Chateau Boutin offers a wealth of options. Butlered appetizers and cocktails on the veranda… or a tapas buffet set-up in the home’s original dining room make a lovely start to your event. Our Signature Five-Course Gourmet Dinner is an ever-popular choice for wedding receptions. This meal, for which the Inn is most noted, allows guests to select a soup, salad, tart fruit sorbet, entrée with side dishes, and dessert. Other options for your Rittenhouse reception may include a Two-Course Petite Dinner offering your choice of soup or salad, and an entrée; a Three-Course Victorian Luncheon consisting of a salad, choice of entrées, and dessert; or even an up-scale Champagne Brunch served with festive mimosas! For wedding parties larger than 35 people, a tent canopy is suggested for set-up on the croquet lawn where everyone can take in the panoramic view of Lake Superior. 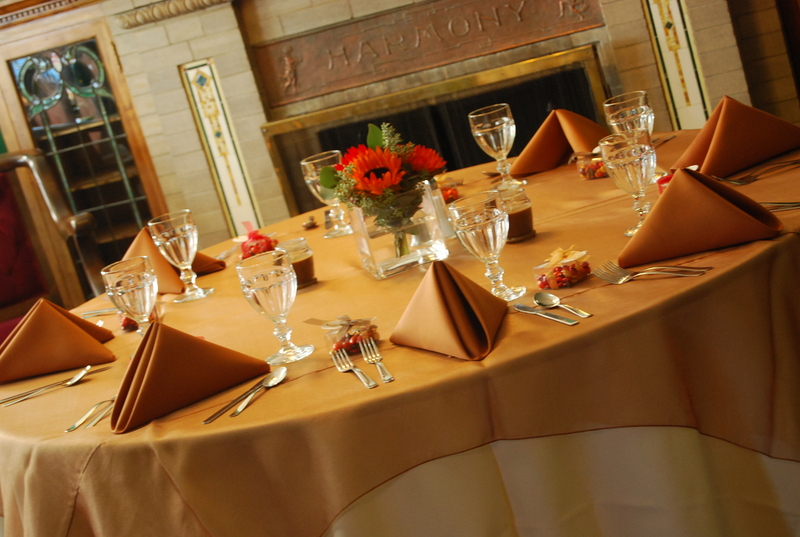 Whether you choose a sit-down or banquet-style meal, we offer a large selection of unique menu items for your reception. Our on-site wedding planner will help you customize a meal that fits your dreams, and your budget. Over the past 35 years, Innkeeper (and non-denominational minister) Jerry Phillips has married literally hundreds of happy couples. We are always grateful to see these couples return, sometimes many years later, to celebrate their special day. I’ll never forget Mary and my first sight of Bayfield. It was a sunny, warm day in June, 1969, when Mary and I drove in from the south and were mesmerized by the lake. Sparkling like a million diamonds, we were spellbound. The town was quiet, not the tourist haven it has become. There were vacant buildings and many “For Sale” signs. We drove the streets, exclaiming about historic house after house, the steep hills giving everyone a view. We stopped at the Community Lunch for a bite, visited Jim and George’s Antique Shop, the Pot Shop of Bob Eckels, the Kerr Gallery. The Boutin Mansion, now called the Chateau, was for sale by Mose Theno, the nuns still living there, and we knocked on the door. A Nun was very cordial and showed us around the first floor, which was very dark…. both from the darkly stained wood as well as the layers of curtains over the windows. We were back outside almost before my eyes had adjusted to the lack of light, and I can’t say that my focus was on the visual as much as the emotional rendering of that visit. At the time, we were engulfed in the process of renovating a Victorian home near Madison that had been beaten up during 30 years as a nursing home. The Chateau in Bayfield was a much grander home, on a magnificent site, with few of the signs of disrespect we were dealing with. Try as we might, the envy was palpable.